Jesús Rafael Soto: The Universality of the Immaterial, on view at the Museum of Latin American Art (MOLAA) in Long Beach, California, from November 20, 2005- March 19, 2006 is an homage to the prophetic Venezuelan artist, credited as one of the founders of kinetic art. Although Soto was involved with the planning of the exhibition , he, sadly, passed away in January 2005, never seeing it come to fruition. The exhibition is named for Soto’s characteristic abstract artworks, which are based on concepts found in mathematics and science. These concepts demonstrate that space is not empty; rather it contains depth and relationships that are immaterial. Instead of creating political or personalized works, Soto worked in abstraction to produce art that could be universally understood. The exhibition features twenty-seven of Soto’s works and is split between two galleries, one of which is primarily didactic. Soto was born in 1923 in Ciudad Bolivar, Venezuela. As a child he developed an affinity for painting, but since art supplies were not readily available in his town he purchased industrial paint and mixed it to create his own medium. Mixing and inventing media and experimentation were methods he continued to use throughout his career. In 1942, Soto received his first formal training in the arts at the Cristobal Rojas Escuela de Artes Plásticas in Caracas. After graduating, he became director of the Escuela de Artes Plásticas in Maracaibo. In 1950 Soto moved to Paris where he became involved with the Galerie Denise René. There he met other artists interested in abstraction including Victor Vasarely, Yaccov Agam, and Yves Tinguely, with whom he participated in the Salon des Realités Nouvelles. During this time he developed his own kinetic language that incorporated series of works that produced the illusion of movement. In 1955 he began creating works that consisted of Plexiglas planes, each painted with a different pattern and suspended on top of one another, separated by mere inches. Seen together, the juxtaposed patterns produced an optical vibration that generated the illusion of movement in the spectator’s retina while s/he walked back and forth before the work. Soto made the invisible visible; thus adding a fourth dimension to the characteristic three on which most art production is based. Jesús Rafael Soto: The Universality of the Immaterial opens with a selection of works from Soto’s 1979 Serie Sí­ntesis that are similar to these early Plexiglas pieces. The nine works from this series are interspersed amongst didactic panels. These panels include Soto’s biography, his influences, a brief history of kinetic art, and Soto’s artistic production. In the center of the room is a sculpture, Sphère de Bale (1997), made of metal rods painted blue and yellow that rise up from a platform on the ground. 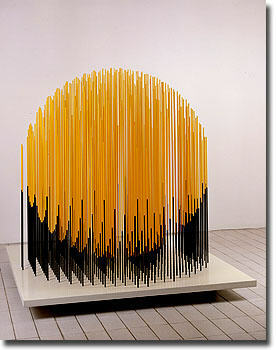 The yellow portions of the rods form the shape of a "virtual sphere" - "virtual" because the metal rods are spaced out, and do not constitute a solid mass.